Great gift ideas love the handbag it so cute. Love the manicure gift set! You deserve that sweater, suits you perfectly! I already eat the chocolate from you, yummy! Thanks dear Ileana, are all fine. Thanks! I'm really glad everything arrived safely and that you liked the chocolate!!! Adorable ideas!!! I love the whole set. I love those cute mittens! Pugs and kisses! Love that! Ooh that pug sweater is so cute! That sweatshirt is just perfect and it was like it was made for you! I think you need that in your closet! Great gift ideas! I think so too!!! I need it :D I want it!!! Great gifts! I especially like the satchel. Love esepecially the sweater and the bag! Harris tweed bag is so cool! Love the satchel and super cute gift set. Thanks for participating in my last post sweety, it was great to hear your thoughts. 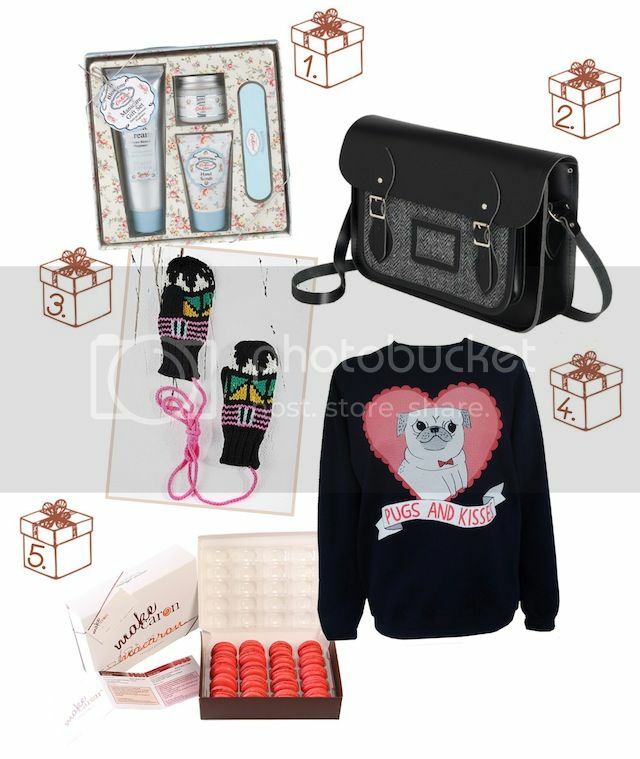 Good picks, that pug jumper is amazing!